It should be common knowledge amongst most technophiles, gamers and media enthusiasts that YouTube has reworked their copyright policies so it's all weighed heavily against content creators. If just saying that doesn't faze you, maybe finding out that whether the content hosts or creators, no matter how big or small, are all being affected, including corporate titans like Microsoft. DualShockers picked up the news thanks to some resourceful users snapping photos of the incident, which is part of what you can see in the main image above. 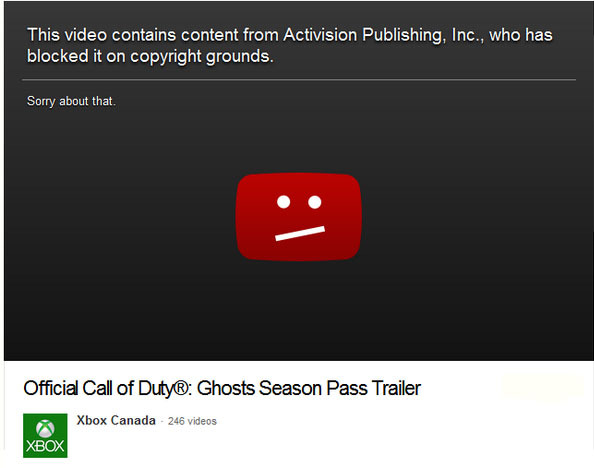 Yes, Activision put a copyright strike on Microsoft's official Canadian YouTube channel for the latest Call of Duty: Ghosts season pass trailer for the Xbox One. As you can see, there are 246 videos on the Xbox One's Canadian channel and the image only shows that message for videos that haven't been deleted but have come under a copyright strike due to a content rights violation. According to DualShockers, Microsoft apparently contacted Activision and had the video reinstated. As you can see from the image below (before more people view the video and drive up the view count) the video barely has any views since it's been put back online. All the thumb downs are in result of YouTube's silly copyright content policy, which will go into full effect starting January, 2014. Right now is just the preliminary spit-storm that comes before the tsunami hits. The comments in the original video are also worth watching, as people are calling out how ridiculous it is that even content distributors are being hit for videos they're promoting. It kind of makes it hard to market and promote content when you can't even show it, eh? There's been quite a bit of fallout over YouTube's change in policies in order to protect themselves from any lawsuits about content plagiarism and copyright infringement, but there has yet to be any sort of resolution to the problem. Most people feel it's best to just abandon YouTube and head to another service. I wouldn't disagree with that decision. For now, any time you upload a video – whether for monetization, informational, entertainment or edutainment purposes – you may have to contend with with a lot of content ID flags and claims of plagiarism. Fair use be damned and YouTube's copyright guide says as much. 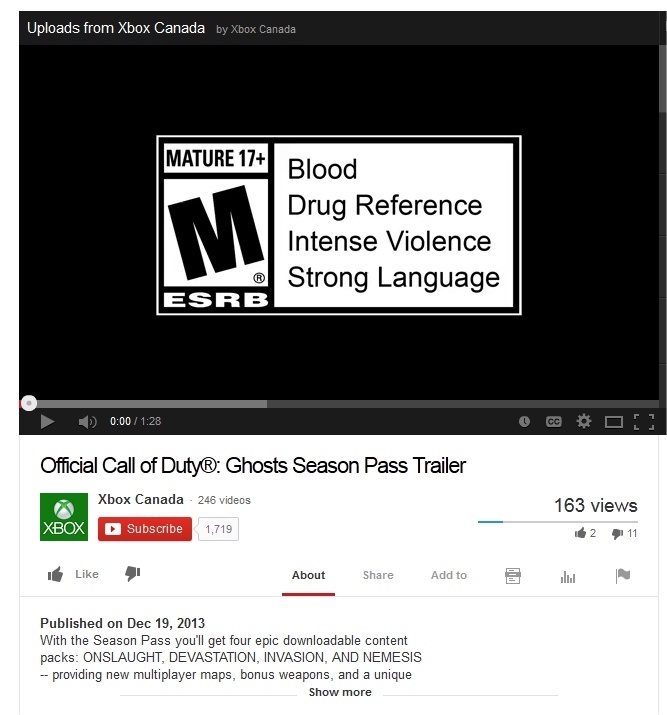 You can check out the original Call of Duty: Ghosts season pass trailer below. In all honesty, without this bit of controversy there wouldn't be anyone watching the trailer anyway.